Hello all and welcome to my new column on mastering lead guitar. This time out we will be covering ways to take regular scales and phrase them in offbeat ways. Rather than relying on adjusting the notes in the scale to build new modes and scales, we will focus on playing around with the rhythms and rhythmic groupings. 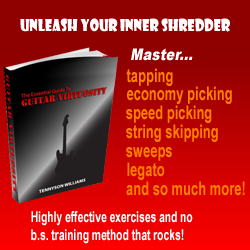 This is one of the best ways to squeeze a lot of interesting licks out of your arsenal. If you take regular sixteenth note rhythms and group them into fives and sevens you can make people stop and say what in the world is that? Keep in mind that if you were to take away the notes and just hear the rhythm it wouldn’t sound unusual at all, but when you group them in odd phrases it sounds like you are indifferent to the beat. The licks appear to float over the rhythm. Look at the examples to get some very useable licks. Try these ascending and descending through any three note per string scale patterns, as well as horizontally and diagonally. This is a way to do what I refer to as tickling the ear. It makes people stop and pay attention. Another way to group things in odd numbers is to take triplets and group them in nines. This works particularly well with sixteenth note triplet patterns. If you group the licks in nines it will put each sixteenth note triplet grouping starting over in the middle of the next group. This is yet another way to tickle the ear. You can also mix regular groups of six with the occasional group of nine. Check out the example to see how! Okay I am going to cheat here a little bit because the next examples aren’t about odd groupings. They simply involve taking regular group of four sixteenth note patterns and make them more interesting by simply starting on a different part of the beat. For instance if you begin on the second sixteenth note of the measure the sequence will become offset making the pattern take on another unusual sound. The same concept can be applied to each of the different beats, starting on the third and fourth beats. Any sequence that is sixteenth note based can be applied to this concept.